If you really want to rev up your metabolism, energy level, and daily detoxification, get a juicer and start juicing fresh vegetables. Your digestive system, hair, skin, and nails will thank you. Heck, every system and cell in your body will thank you. If vegetable juice sounds gross to you, I'd be willing to bet it's because you've never tried freshly juiced versions of it. Carrot and beet juices are incredibly sweet and delicious; I promise you, you won't feel you're torturing yourself to get it down. In this version, the parsley tones down the sweetness of the carrot and beet, giving the juice a wonderful green/herbal note, and the ginger gives you a spicy burn in the throat that you'll love. Juicing fresh veggies allows the vitamins and minerals--the real nutrition--to digest and assimilate into your system in a matter of minutes, with minimal effort or exertion on the part of your digestive system. That's why you'll notice a subtle "lift" in energy right after you drink a glass of fresh veggie juice. 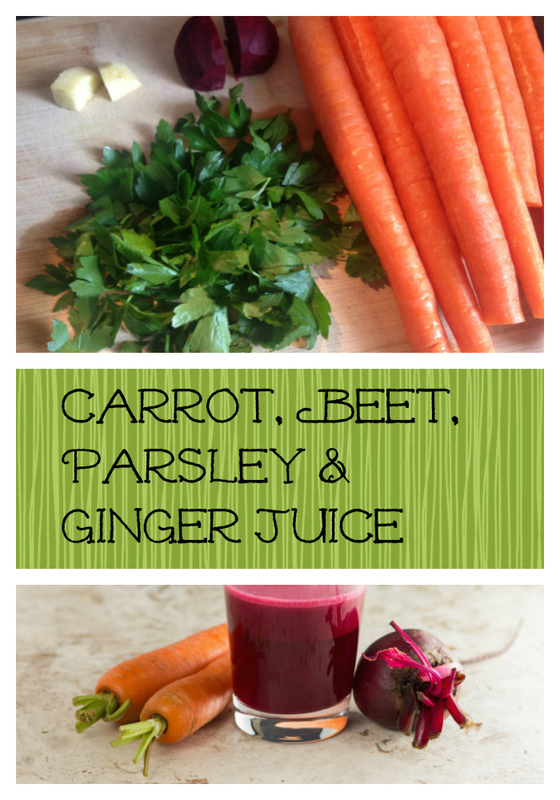 Carrot juice and beet juice are a wonderful source of potassium, phosphorous, sulfur, and other alkaline elements, abundant Vitamin A, and vitamins B, C, D, E, and K. They are natural builders of the blood cells. Parsley juice helps maintain the normal action of the adrenal and thyroid glands as well as strengthening blood vessels, and is good for kidneys and bladder. Ginger juice has anti-viral, anti-inflammatory, and anti-fungal properties, and is good for sinuses and digestion. All of these veggies are excellent cleansers, and they will make you more regular. I always start with 1 carrot piece, then a small handful of the parsley, then a piece of beet, more parsley, a piece of ginger, more parsley, piece of beet, parsley, more ginger, finish off the parsley, then juice the rest of the carrots. Parsley gets stuck in the machine if you don't chase each bit down with the harder veggies. Finishing off with the carrots pushes everything else through all the way. Strain if desired (you'll probably have a foamy "head" on your juice if you don't--no biggie if that's okay with you) and drink immediately. Clean the juicer parts immediately unless you enjoy scrubbing a lot. And enjoy your healthy life!